What IS this Church that Jesus is building? What does it look like? Where is it located? Who is in charge of it? Do the religious institutions and leaders of today really represent the faith that was first given to us by Christ, taught by the apostles and confirmed by the Holy Spirit? Or has Christianity been replaced by “Churchianity”? Some say God is calling us to restore the Church to what it used to be. They believe the answer lies in preaching, repentance, reformation, and working from within the system to repair it. But a growing number of Christians say that the Church as it exists today was never God’s intention in the first place. They have forsaken the “old wineskins” and religious structures of Christendom to follow Jesus in the simplicity that the early Christians followed Him. They are not called to fix the system, but to come out of it altogether. They still love the people, and are concerned for the people. They do miss something of the fellowship they once thought they had. And sometimes they miss it so much that they do go and visit other churches, trying to fit in, trying to find a place. But try as they might, something in them just cannot go along with it anymore. Who are these people? They are part of a growing number of Christians that make up a “Church in the Wilderness” – followers of Jesus from all over the world who love God, and love God’s people, but reject the trappings of Sunday Morning Religion. This mass exodus of people from the religious system is not only inevitable, it is the fulfillment of prophecy, and sets the stage for “the final chapter in Christianity” – when Jesus suddenly returns to reward the Overcomers, judge the hypocrites, and establish His Kingdom on earth. 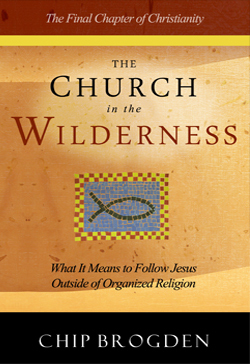 In his newest book, “The Church in the Wilderness: What It Means to Follow Jesus Outside of Organized Religion”, Chip tears down the sacred cows and religious traditions of “Churchianity” and paints a picture of what Jesus really wants. This book includes many of his most popular essays as well as some brand new material never released. If you still attend church, you’ll be confronted and challenged to consider a different point of view. If you don’t attend church, you’ll be encouraged to know you are not alone. But regardless of what you believe, you’ll have your eyes opened to a spiritual vision of “church” the way Jesus meant for it to be.